I realize that it has been nearly two months since I updated my blog. Don’t worry. I am still here. I still have a lot on my mind, and have been meaning to write, but the urgency to write which I felt before has let up some. In the thick of things this past year, I felt a strong pull to put my thoughts to paper. Writing was the only way to sort out the complex jumble of thoughts and fears, and dig for some sense of peace with what I was going through. Now, as I continue to move forward, I don’t feel the same pressing sense of urgency to put my thoughts to paper, so maybe you’ll hear less from me. Maybe…. The completion of radiation in the end of September marked the end of active treatment against cancer for me. For 10 months, this vigorous battle dominated nearly every aspect of my life. The abrupt change from constant doctor’s appointments, major side effects, and a underlying, ever-present focus on whipping cancer, to a return to… “normal” life, left me thinking, “now what?” Where do I go from here? So much has changed. The important things in life are that much more important now. The unimportant things in life are that much more unimportant now. Facing fears, and pain, and setbacks seems to be a regular part of every day, yet I have new goals. Some are previous goals that have been neglected. Some are new goals. Life is too precious, and there are no guarantees that I’ll be around long enough, to put off the hopes and dreams I have for my life. What all of this means, I am not sure. But I am excited to find out. Excited to move forward. Though I sometimes feel manic excitement to jump head first into this new chapter, waste not a single moment, I also realize that it will take time. I don’t have the strength or the energy that I used to have. I see glimpses of my old strength at times, but only glimpses. It seems that I can’t complete the tasks that I set for myself in the time I think I should be able to complete them. It frustrates me. I don’t have time for the patience of my younger self. I know that I need to learn, for now, to take on less, slow down, do things at a reasonable pace. Balance. I have one more major hurdle to clear on this journey. Two weeks from today, I will be undergoing reconstruction surgery, along with the removal of my chemo port. I look forward to getting it done, or, rather, to getting it over with. In fact, I pushed the doctor to let me do it before the end of the year because I want this chapter to close with the end of 2014. I am not looking forward to another surgery, another recovery, another pause from the things I want to be able to do. I can say one thing with certainty, though – look out 2015! This New Year has new meaning and I am going to come on strong! Tuesday, July 1st was my last round of chemotherapy! A huge milestone, no doubt, and I am happy to be able to say that the experience of chemo is behind me. Never again (I pray) will I have to sit for hours with these chemicals coursing through my body. But, I’m not cracking the champagne yet. Realistically, it is merely the last hurdle in an event that is not yet finished, and there are additional events still looming on the horizon for me. As in track and field, the last hurdle needs to be taken cleanly and the runner still needs to land firmly on their feet and sprint across the finish line. With the hurdles behind me, the final sprint is proving more difficult than I had imagined. I have cleared many hurdles and fought for my strength between them, seemingly just in time to clear the next hurdle. But the cumulative effect of the hurdles, chemo with its side effects, has left me weak. I was prepared, mentally, for the last round to end on July 1st, but that is just the first part of the last round – I still need to land and make it to the finish line. The drugs, along with their debilitating side effects will remain in my system for another four to six weeks, at least. I did not mentally prepare myself for that, and then, yesterday, that reality made me falter. Going into the last round, I was already anemic, on the verge of needing a blood transfusion, and profoundly fatigued. I guess I had prepared myself to breathe a sigh of relief and move forward at this point, but the side effects hit me hard again this time, throwing me off balance. Physically, I have never felt weaker. Small tasks sap any remaining energy I might have been able to summon. I have to stop to catch my breath halfway up a flight of stairs. The long list of things I want to do each day seems insurmountable. Digestive problems have made it difficult to eat properly. Nothing tastes right, and my appetite is off. If I chose to eat the wrong thing, I become extremely ill. I also find it really difficult to keep hydrated, which further weakens me. Body aches and bone pain make getting around a struggle, too. Lately, I have been sleeping, hard, for fifteen or so hours a day, and it’s still not enough. Unfortunately, each round requires steroids to lessen the side effects, and with that, disruptions to the sleep I crave. Without sleep, and nourishment and water, I am finding it hard to rebuild the strength I need to cross the finish line. Emotionally, it is taking a toll on me, too. I was not prepared for the physical effects of the final round, nor their effect on me emotionally. Chemo throws the body into sudden menopause, with its accompanying emotional moments. This week, the sleeplessness, chemo-pause, dehydration and negative external forces have been more than I was ready to handle. This weekend has been particularly hard for me and a low point on this journey. It is the Fourth of July weekend. It is perfectly beautiful summer weather, yet I feel like I’m in someone else’s surreal life. It feels like a haze is over me. Surely, I did not just go through chemotherapy. This can’t be my body struggling to do simple things. None of it seems real. I am sad to be missing the usual celebrations that I have always shared with my kids on this holiday. There will always be an empty gap where there should have been more. Andy, who has been there for me when my own strength waivers, reminded me that missing this year’s memories to focus on getting healthy will ensure many more years of memories to come. I have to keep that thought clear in my mind when I’m feeling down. My priority right now has to be on my recovery and health, so that I will be here for all of the happy memories to come in my future. I have a month to get back on track, rebuild and recover from the hurdles of chemotherapy before tackling my next event – radiation. I’m confident that I will be ready. Today is a new day, and I feel like I am back in my own life again and ready to reach the finish line. I am sitting in my quiet house, remembering a special moment with a smile on my face, so I thought I would share this happy moment. 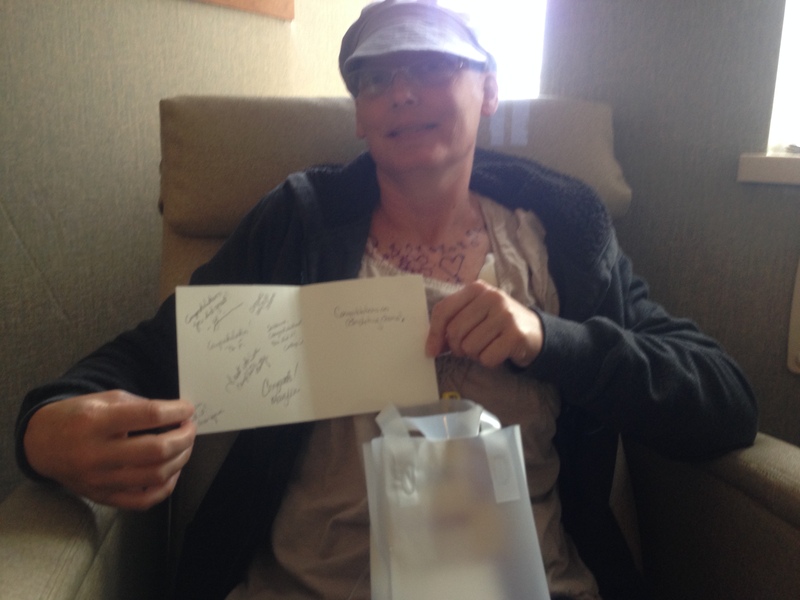 Prior to my first round of chemo, I had an appointment to meet with the radiation oncologist. 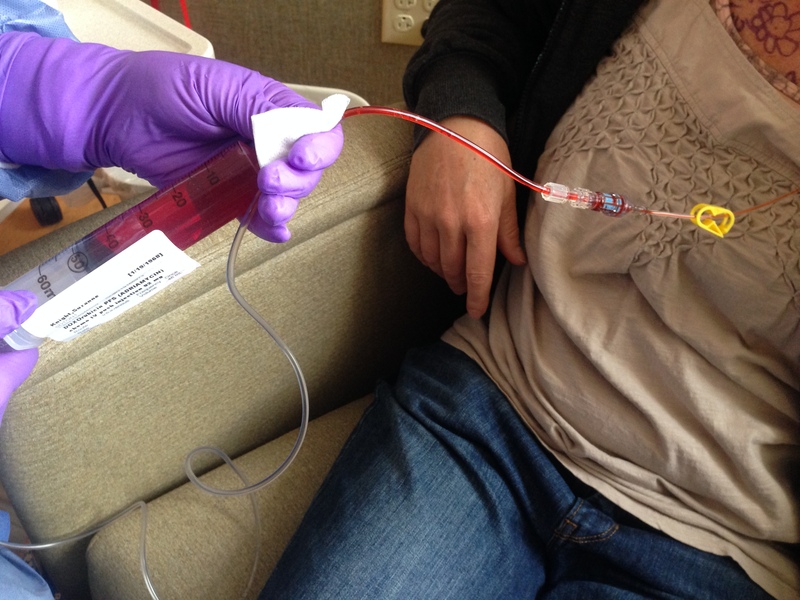 The wait was especially long that day, and I was nervously anticipating my first experience with chemo which was scheduled immediately after this appointment. Finally, it was my turn to head to the exam room with the nurse. We went through a long list of questions, and then it was time to get a gown on and wait for the doctor. 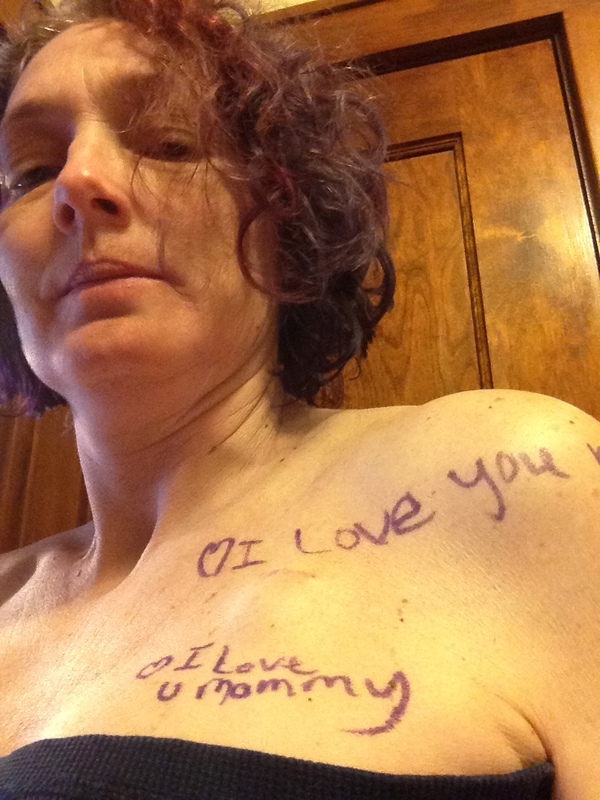 As the nurse was leaving, I decided to show her the love notes that my kids had drawn on my skin surrounding the port where the drugs would be infused. That morning, I had asked them to write something there for me. It was my attempt to ease some of the fears they were having about their mom heading off for chemo. I told them it was “port support”. The nurse said she’d never seen anyone come in with love notes written on them before. She told me that there are special things that she sees only occasionally. Things that will forever remain in her memory. This was one of those things she said she would never forget. She was so moved that she nearly came to tears, and gave me a great, big huge. I left the appointment with such a warm, happy feeling. Can you guess which of my creative, artistic kids wrapped the love all the way around my back?